We have held three Institutes during the month of April on the subject of biblical preaching. Each of these has been well attended and well organized. I am deeply grateful for the support of Ligonier Ministries in the way they have come along side of us through email blasts, marketing, and lending us their personnel. 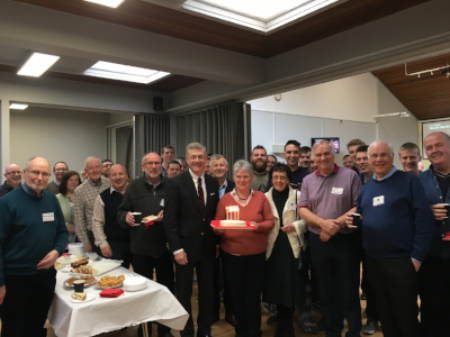 For the first time, we held an Institute in the Republic of Ireland, in the city of Abbyleix, with 60 men in attendance. This was a one, all-day conference and was attended by church pastors, Bible teachers, and those considering ministry, whose hearts were especially eager for this teaching. These men who serve as pastors in this heavily-Catholic nation came with eager minds, ready to take in this instruction on biblical preaching. My own heart was encouraged by their responsiveness as we invested this invaluable time with them. We also hosted an Institute in Belfast, Northern Ireland at the Great Victoria Street Baptist Church in the heart of downtown Belfast. Over 70 pastors and young men were in attendance for this two day conference on The Preaching of the Reformation. The focus was upon the powerful preaching of Martin Luther, John Calvin, John Knox, and the English martyrs under the reign of bloody Mary. The challenge to be bold in the pulpit came through loud and clear through the studying the example of these Reformers. Though it was not an official OnePassion Institute, I nevertheless was able to teach the same material to many pastors in Southaven, Mississippi on expository preaching. This conference consisted of two days and was I believe much needed and well received by the attendees. I also flew to St. Louis, where we held another Institute that was, again thankfully, well received. There were 108 attendees at this conference held at Brookes Bible College, and I must tell you, the atmosphere was electric. These men were probably the most enthusiastic of any Institute that we have yet hosted. Their excitement to learn this material and to interact with me in question and answer sessions was dynamic and highly-productive. I am deeply grateful for the impact I see from these events around the world and pray God will continue to use these to strengthen pastors in the proclamation of His word. I continue to be amazed at the expanding viewership of our Men's Bible Study that we hold each week in Dallas, Texas. In attendance are 30 to 40 men who meet in a boardroom with me to study the word of God. This Bible study is live streamed online and is viewed by thousands of people all around the world. Some 10,000 people each week view our men's Bible study in places like Vietnam, Dubai, Singapore, India, Africa, Australia and countless other places. We continue to produce podcasts that are 7 to 8 minutes in length, that are posted weekly on our website. Each podcast deals with some aspect of expository preaching and proves to be helpful to men who preach the word of God. I believe that these podcasts make a strong contribution to the ongoing pulpit ministry of countless men who take advantage of this ministry. Topics have ranged from the role of prayer in preaching, crafting a sermon outline, the influence of church history and many other practical topics useful for those in ministry. We produce the Expositor Magazine which comes out every other month. During this year, 2017, each issue is focused upon the preaching of the Reformation. As you are aware, this is the 500 year anniversary of the start of the Reformation, that was ignited when Martin Luther posted his 95 theses to the front door of the castle church in Wittenberg, Germany. This proved to be the launching point for the momentous Protestant movement. Already, we have published an issue on the Pre-Reformation and the preaching of John Wycliffe, followed by an issue on the German Reformation and the preaching of Martin Luther. This upcoming issue that we have been working on these last two months is focused upon the Swiss Reformation and the preaching of John Calvin. This next May/June issue includes articles by Sinclair Ferguson, Joel Beeke, John MacArthur, Robert Godfrey, Sean Wright, and myself. This is issue number 17, and, I believe, it is the best one yet. If you are not a subscriber to this magazine, produced by OnePassion Ministries, you visit our website and sign up for an annual subscription here. Back issues can also be purchased individually if you missed any issues you would like to have. During the month of April, I have been privileged to preach in many places, both overseas and in the United States. I was privileged to travel to Lisbon, Portugal, where I spoke multiple times at the FIEL Conference to some 250 pastors and their wives, along with interested young men considering ministry in their future. This conference was in the Portuguese language, and I am thankful for the translators who enabled me to speak to those in attendance. Many of my books have been translated into the Portuguese language by this ministry, which allows me an extended influence into the Portuguese-speaking world. I also preached in Ireland, at Grace Community Church, Rosscommons with a packed church that Sunday evening. I spoke on "The Sufficiency of Scripture," and I will long remember their eagerness to receive the teaching of the word of God. Further, I had opportunity to preach in Lisburn, Northern Ireland, at Emmanuel Baptist Church. Andrew Curry is the pastor, and he is a student in the Doctor of Ministry program that I oversee at The Masters Seminary in Los Angeles. This Good Friday Service was a special service with this congregation as I preached on the scene at the cross, "The Crucifixion of Jesus Christ," from the Gospel of Mark, chapter 15. In addition, I preached in Southaven, Mississippi at Brown Missionary Baptist Church for their Contending for the Faith Conference. I addressed the pastors from 1 Timothy 4:13-16 on "The Priority of Expository Preaching." I then stayed in order to preach the Sunday morning service at this same church. The sermon was on "It Will Cost You Everything" from Luke 14:25-35. It was a joy to be with them and exposit the word at the conference and their worship service. Further, I preached at Believers Chapel in Dallas this last Sunday morning on "I Am the Bread of Life" from John 6:35. Lastly, I want to invite you to come be apart of our English and Scottish Reformation tour August 26 - September 3, 2017. We will start in London and then travel to Cambridge, Edinburgh and St. Andrews in an incredible journey tracing the events of the reformation in these monumental places. We still have room to register so please consider joining me on this life-changing tour. You can find out more information here: http://www.onepassionministries.org/tour/ and watch the video below to give you a brief glimpse of this upcoming tour. The month of April was an opportunity to serve the Lord in many ways in many different places. Eternity will reveal the fruit of our labor. Thank you have partnering with us. Your help is greatly appreciated. As you continue to support this ministry with your prayers and finances, please know that you are participating in a widespread effort to reach the world with the gospel of Jesus Christ. May the Lord bless you for standing with us in these days.